The UK is already chock full of surveillance cameras—for your protection—and now that iris scanning technology is beginning to catch on, it may only be a matter of time before it's a widely practiced method of identification. Xvista has been hard at work improving iris scanning technology, having just developed the UK's first portable iris scanner. Small enough to be fitted inside a cellphone, xvista's technology could conceivably be integrated into heavily trafficked areas, such as airports. Perhaps less settling is the fact that all such scans can be entered into the company's central database. Who has access to the database and why they even need access isn't exactly trumpeted on the company's Web site. As for the implementation, the company says that a 256MB card can hold more than 250,000 individual scans. 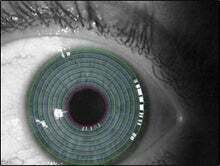 Since iris scanning technology is quite accurate, with the odds of two irises matching being less than 1 in 7 billion, expect to see this technology make more inroads as time marches on. Remember, remember.